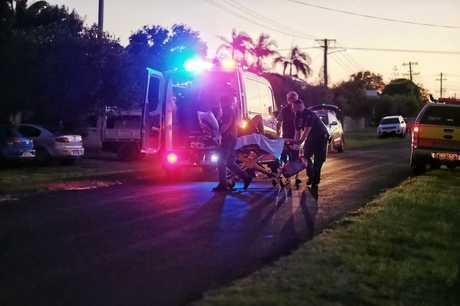 UPDATE: BUNDABERG Police say charges are yet to be laid over a shooting incident in Burnett Heads on Monday afternoon. Investigations began after two men told police they were shot in the leg while fishing near the ex-HMAS Tobruk. The 19 and 24-year-old men, who said they were approached by three others at the site, suffered substantial injuries and underwent surgery in hospital yesterday. Police have searched a Kalkie address and seized a 2004 red Holden Commodore. A Bundaberg Police spokesman confirmed this morning that police were still looking for those involved in the crime. "No one has been charged yet and police are still investigating," the spokesman said. The suspects are believed to be aged in their 30s, solidly built with tattoos. If you have any information, phone Crime Stoppers on 1800 333 000. EARLIER: TWO men who were shot in the leg at Burnett Heads yesterday have told police they were approached by three men while they were fishing near ex-HMAS Tobruk. Bundaberg Criminal Investigation Branch Detective Sergeant Andrew Self said, as a result of investigations, police searched a Kalkie address overnight and seized a 2004 red Holden Commodore, but no one had been charged and police were still actively searching for those responsible for the shooting. "There was an incident there involving two young males, aged 19 and 24," Det Self told media this morning. "These males have stated to police that they were fishing at that location and confronted by three men. "We're currently looking for men approximately in their 30s who are solidly built and tattooed. "An altercation, police believe has taken place resulting in the discharging of a firearm where the two young male victims were injured. "Those two males have been taken to hospital and they're still in the Bundaberg Base Hospital with substantial injuries. "They underwent surgery last night. "The injuries are not life threatening however they are substantial." 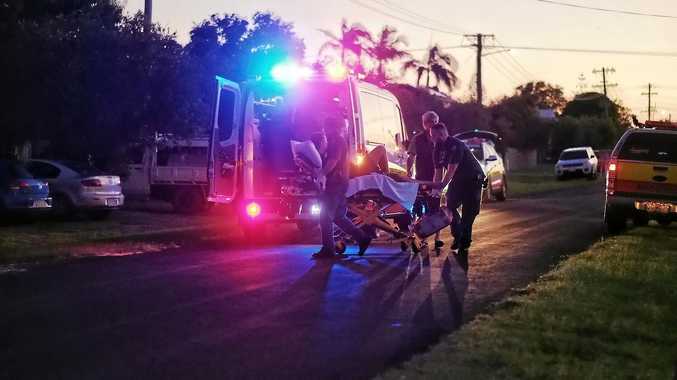 Police and paramedics were called to Duffy St in Burnett Heads just after 5pm yesterday following reports two men had been shot. Det Sgt Self said police were seeking any information from members of the public about a red 2004 Holden Commodore which was seen in the area leaving the scene. "We believe that vehicle has got some involvement so if anyone has seen a vehicle matching that description around the port of Bundaberg late afternoon, if they could contact Crime Stoppers," he said. Det Sgt Self said police were still waiting to speak further with the two male victims and no weapon had been found. 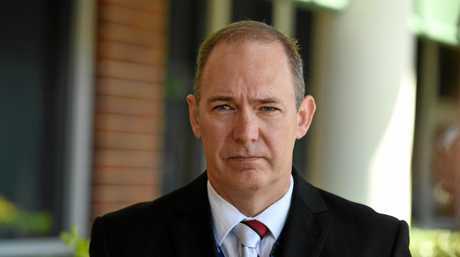 "We have made extensive enquires and searches throughout the night, we've searched one premises in Kalkie, seized two vehicles and the investigation is ongoing," he said. "At this stage it appears to be random but of course we keep our options open. 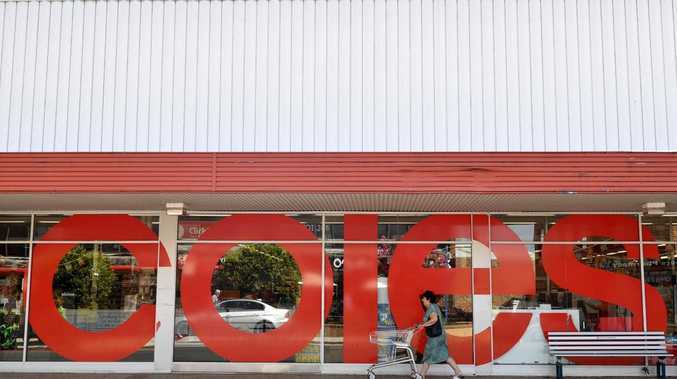 "It does appear to be an armed robbery, of concern obviously to us particularly, is not just the robbery but the fact that we've had a discharging of firearm arm and injuries. "We take those matters extremely seriously and significant resources are being deployed currently to identify and arrest these offenders."